71 Marlborough is located on the north side of Marlborough, between Berkeley and Clarendon, with 67 Marlborough to the east and 73 Marlborough to the west. 71 Marlborough was built ca. 1864 for shipping merchant and real estate investor John Lowell Gardner, one of nine contiguous houses (71-73-75-77-79-81-83-85-87 Marlborough) he had built as rental property. He and his wife, Catharine Elizabeth (Peabody) Gardner, lived at 7 Beacon and then at 182 Beacon. 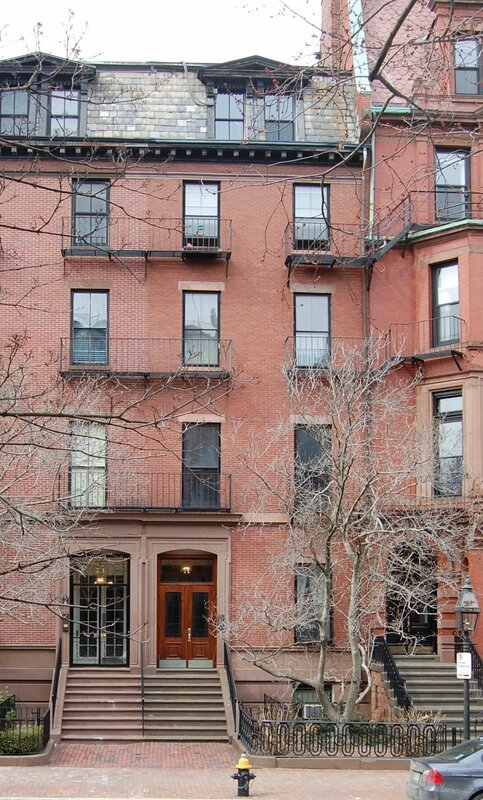 Click here for an index to the deeds for 71 Marlborough. By 1864, 71 Marlborough was the home of Dr. Algernon Sidney Coolidge, a physician, and his wife, Mary (Lowell) Coolidge. They previously had lived at 14 Chauncy. Algernon Coolidge’s brother, Joseph Randolph Coolidge, was married to John Lowell Gardner’s daughter, Julia (Gardner) Coolidge; Mary (Lowell) Coolidge was the granddaughter of John Lowell Gardner’s sister, Mary (Gardner) Lowell, and Francis Cabot Lowell. 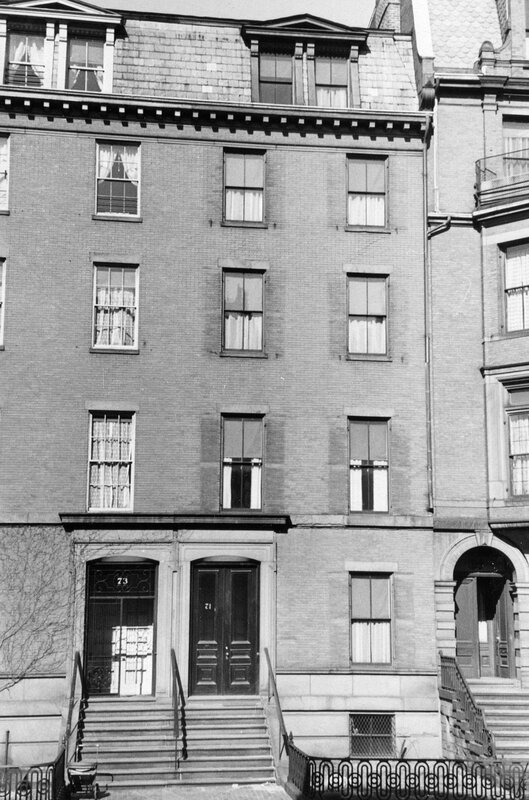 The Coolidges continued to live at 71 Marlborough in 1871. They subsequently lived at 70 Chestnut and 1 Fisher, and by 1879 at 81 Marlborough. By 1872, 71 Marlborough was the home of Elizabeth Gorham (Gray) Story, the widow of Franklin Howard Story, a merchant, who had died in February of 1871. Prior to his death, they had lived at 20 Chestnut. In 1877, she was joined by her granddaughter and her husband, Elizabeth Gray (Story) Gray and Edward Gray, a cotton broker. They previously had lived at 183 Beacon with her parents, Franklin Howard Story, Jr., and Adeline (Wainwright) Story. By 1878, they had moved to 214 Beacon. Elizabeth Story continued to live at 71 Marlborough until her death in February of 1885. In 1885, 71 Marlborough became the home of Dr. Morton Henry Prince and his wife, Fanny Lithgow (Payson) Prince. They had married in February of 1885 and 71 Marlborough probably was their first home together. Morton Prince was a psychologist specializing in neurology, psychotherapy, and abnormal psychology. The Princes continued to lived there in 1894, but had purchased and moved to 458 Beacon by 1895. 71 Marlborough was not listed in the 1895 Blue Book. By the 1895-1896 winter season, it was the home of Adelia (Conant) Winslow, the widow of Thomas S. Winslow, and their daughter, Adelia Isabel Winslow. They previously had lived at 16 Marlborough. 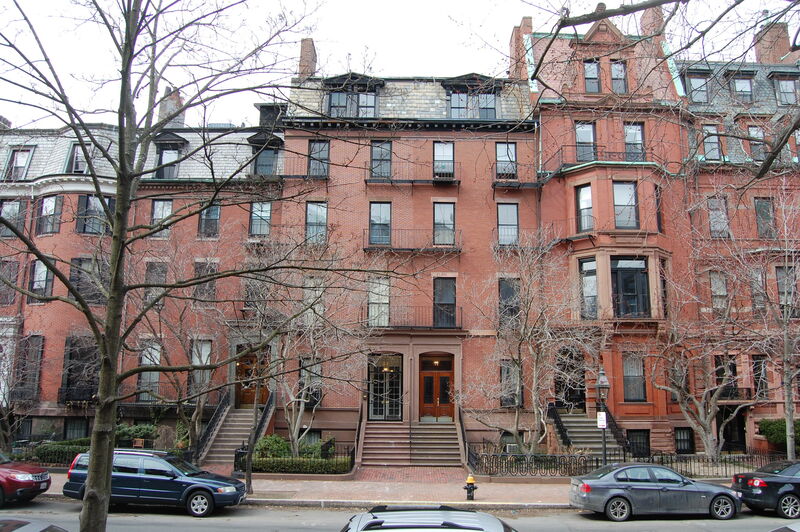 They continued to live at 71 Marlborough until September of 1899, when they moved to Hale House at 6 Garland, a settlement house and social center for the children of the Dover Street neighborhood. Hale House had been founded by the Tolstoi Club, of which Dr. Edward Everett Hale was president, and was named in his honor. A. Isabel Winslow was the resident director of Hale House from September of 1899 to 1906. On December 21, 1899, the trustees under John L. Gardner’s will transferred 71-73 Marlborough to his grandson, Francis Skinner, Jr.. He lived at 266 Beacon with his widowed father, dry goods merchant Francis Skinner. He married in June of 1900 to Sarah E. Carr; after their marriage, they lived in Dedham. He continued to lease 71 Marlborough and 73 Marlborough to others. By 1900, 71 Marlborough was the home of Mary Wilder (Foote) Tileston, the widow of paper manufacturer John Boies Tileston. Prior to his death in January of 1898, they had lived in Milton. She was an author of inspirational works (including Daily Strength for Daily Needs and Joy and Strength) and of genealogical materials and memoirs. She continued to live at 71 Marlborough in 1906, but had moved to 99 Mt. Vernon by 1907. On August 24, 1906, 71 Marlborough was purchased from Francis Skinner, Jr., by Dr. Joseph Payson Clark. Joseph Clark was a physician, specializing in diseases of the throat. He was unmarried. He maintained his home and medical office at 71 Marlborough, and also rented residences and office space to other doctors. He previously had lived and maintained his office at 409 Marlborough, and prior to that at 76 Marlborough with Dr. Charles Wendell Townsend. Longer term residents at 71 Marlborough with Dr. Clark were Dr. Harry Winfred Goodall (from 1907 through 1909), who moved to 213 Beacon by 1910; Frederick G. Hopkins (from 1912 through 1931), a leather merchant who also maintained a home in Dover and later in Orleans; and Dr. Theodore Jewett Eastman (from about 1913 through 1931), who had lived at 396 Marlborough in 1912. 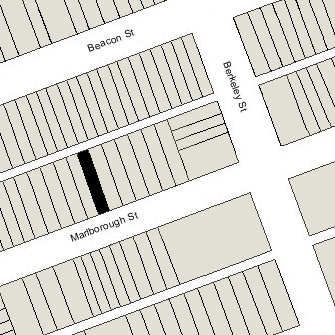 Dr. Clark’s brother, Herbert Clark, a real estate dealer, also lived at 71 Marlborough from about 1917 through 1936. He previously had lived at 385 Marlborough. 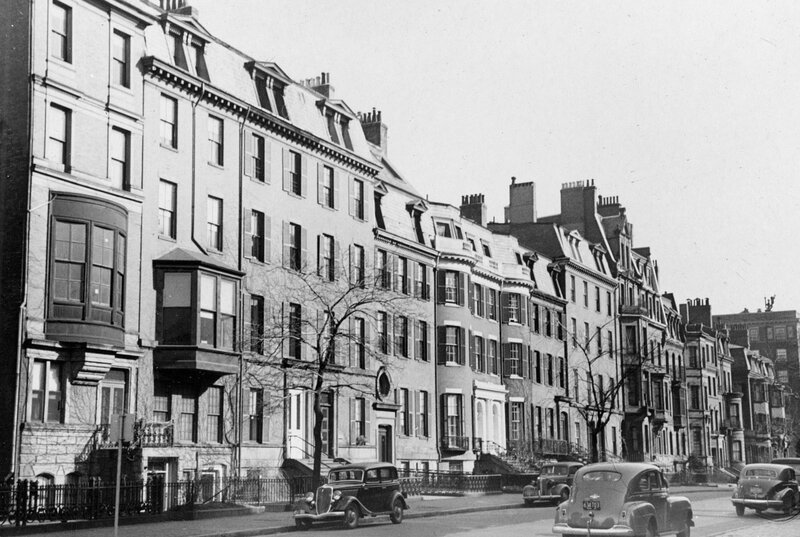 J. Payson Clark continued to live at 71 Marlborough until his death in July of 1940. The house was shown as vacant in the 1941 City Directory and was not listed in the 1941 and 1942 Lists of Residents. On February 7, 1941, 71 Marlborough was acquired from J. Payson Clark’s estate by Edward F. McKnight. In May of 1941, real estate agent Donald Allmon of R. M. Bradley & Co. filed for (and subsequently received) permission to convert the property from a single-family dwelling into a lodging house. On June 2, 1941, 71 Marlborough acquired from Edward McKnight by Julia Szabo. 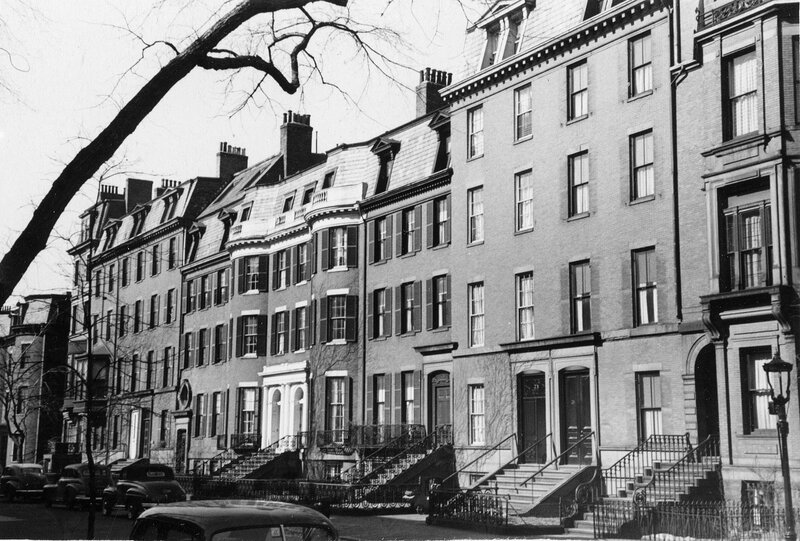 On January 5, 1942, the Workingmens Co-operative Bank foreclosed on its mortgage to Julia Szabo and sold 71 Marlborough to Mabel C. Adams, and on April 16, 1942, she sold the property to Shirley Clifford Speed, a real estate dealer who converted many Back Bay houses into lodging houses and apartments. By 1943, 71 Marlborough was the home of Leon Mitchell Marshall and his wife, Winona E. (Webb) Marshall, who operated it as a lodging house. They previously had lived at 34 Hyde Park Avenue. On June 30, 1944, the Marshalls acquired the property from S. Clifford Speed, and on March 13, 1958, Leon Marshall transferred his interest in the property to his wife. Leon Mitchell died in January of 1968. On October 7, 1968, 71 Marlborough was acquired from Winona Marshall by Anthony P. Baker. On January 11, 1982, 71 Marlborough was purchased by Barrett Enterprises Inc. In April of 1982, Barrett Enterprises applied for (and subsequent;y received) permission to convert the property from a lodging house into six apartments. 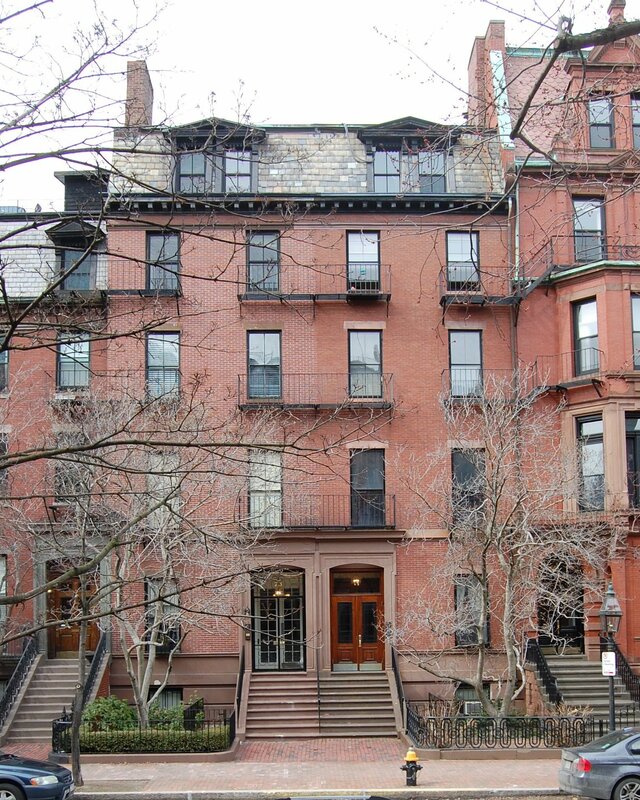 On July 26, 1985, it converted the property into five condominium units, the 71 Marlborough Street Condominium.